Our roving reporter brings you the best of the spring ski conditions in April, finishing up the same week that the main lifts close in Chamonix. But the skiing will carry on at Les Grands Montets until 1st May! Watch the latest Chamonix snow report and follow us on Facebook to be the first to see new videos twice a week. Spring finally arrived in Chamonix with the passing of Easter. While we have had fresh snowfall and can expect a few more dustings in days to come, warmer winds are moving in. There is humidity expected this week and the promise of more sunshine by the end of the week. Do beware of closures (limited piste access) on Friday, with Fœhn-generated sunny spells creating melt-back of fresh snow, which can affect snow safety. There is still an incredible 4m of snow at the top of the Index lift at La Flégère and 3m at the Mont Blanc Legend BBQ spot featured in this week’s report; 21cm of new snow is forecast for this week! low pressure area will turn into a frontal trough, North Sea to Balearic Islands, the mainly Southerly stream will drive humid Mediterranean air puffs up to the Alps in the first part of next week in a persistent Fœhn pattern. La Flégère is our sunniest ski area with skiing for every level, ideal for spring family fun with their BBQ zone. For more adventurous snow bunnies Flégère has famously steep runs from the Floria drag lift (téléski) and on 15th April will host a Banked Slalom event for brave boarders! The children’s “Mont Blanc Legend BBQ zone” sponsored by Haribo is a groomed play area for children with a picnic zone for all to enjoy. There is even a BBQ (cleaned and maintained for free public use). You can find this zone on skier’s right of the Libellules green run. The new snow rescue practice zone, or “DVA parc”, can be found just next to the children’s play zone and allows you (or your kids) to put your own ARVA/DVA and avalanche rescue kit to the test; find the beacons hidden in the snow and you’re a champion! 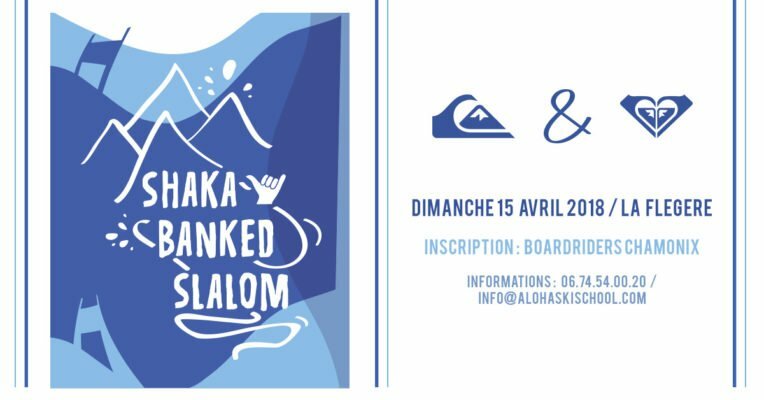 15th April Banked Slalom Competition: This will take place on the steep piste near La Chavanne restaurant which will open specially for the occasion with live music and DJs accompanied with casual food and drinks. Sign up at Boardriders store in central Chamonix. You can access Flégère directly by way of the cable car departing from the village of Les Praz. Alternatively, La Flégère is easily accessible from Le Brévent by skiing across via the ‘Liaison lift’ that links the two. 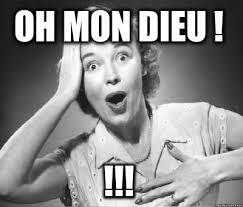 ALSO check out our Musilac package deals here! GET INVOLVED & all the best! We have an exciting week ahead with more sunshine – the inaugural Musical Mont Blanc festival – AND a big announcement from Chamonix All Year! Therefore we celebrated with a team ski day and were surprised to find fresh (wind affected) powder patches. This weekend expect mixed visibility as a high pressure system grows from the Balkans towards the Northern Adriatic Sea; this will mean mild dry weather for the coming week with windy patches of intermittent fœhn. The changeable spring snow pack means you should have your board or skis tuned for all conditions. Be it icy mornings or slushy afternoons – stay sharp and waxed! Sunny spells and cool atmosphere in the morning ‑ very mild with increasing cloud in the afternoon ‑ fœhn puffs likely at times. 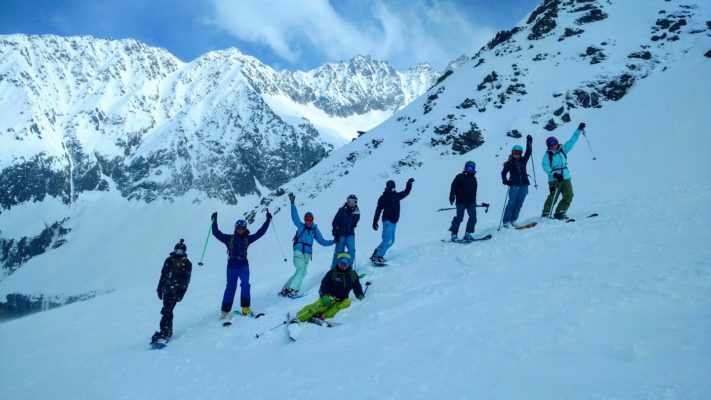 Make like Chamonix All Year staff and ski this week at our highest altitude ski area Les Grands Montets (3300m)! Grands Montets is home to some of the most challenging terrain of Chamonix’s ski areas. However, even with such a large group of mixed levels and preferences, we were able to find something for everyone (even some powder!). With 6 blacks, 4 reds, 5 blues and 1 green run Les Grands Montets is a great choice for large groups and families. Due to the North-facing aspect, the snow here will also stay cooler and fresher during spring mornings. Les Grands Montets closes May 1st for the season. La Flégère is our sunniest ski area and also has mixed terrain for every level. It is the ideal choice for spring family fun when the sun is out (if you don’t mind softer snow) with their famous BBQ zone from our last report. Some of the biggest acts to ever visit Chamonix in one spot (Bois du Bouchet) – over three nights – is here this time next week! We have your last-minute discount package deals here: amazing value that allows you to “rock and ride” – you can enjoy all day spring skiing with your ski pass included alongside your festival tickets, all the while settled in to one of our accommodations nearby to suit your needs.